It is hard writing a blog. Yes, I know, boo hoo, you have to do research and drink beer. Then you get to shoot your mouth off, figuratively, about what you think about this said beverage. Yes, yes you can feel my pain. Often in my blogs, I ponder food pairing options or try to give a little history. Then I think about whether this flavour is right for the style, what glassware is proper, are there any off flavours, etc, etc. The Appleton ESB halted this process very quickly. The current BJCP guidelines do not have an ESB category, it has been replaced by 11c Strong Bitter. Fullers has trademarked the term "ESB", which might have something to do with this change. Perhaps the Appleton has a little too much diacetyl and not enough hop character to really fit into this category, but that is beside the point. Flavours can be potent memory triggers of past events. The smell of pine can take you to a memorable Christmas where there was a freshly cut tree in the living room. Going to the movies can remind you of a certain place on the waterfront or a numbered pub. See, they are not always pleasant. One sip of the Appleton pulled my memories to a recent trip to England. It took me right here. 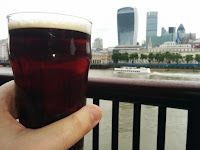 We were walking along the river Thames and stopped off at the pub for a pint and nachos. Actually it was two pints; they were low alcohol and I was gathering Untappd badges. Now that I look back, the Runner was much tastier this the Hoyne. Regardless, the memory recall was there. The pen and notepad were forgotten and the feet rested themselves on the coffee table. A long drink of bitter blurred realities, the room temperature cooled, nostrils filled with the stench that is the Thames and the vacation mindset returned. This brief interlude was quickly dissolved by the sound of my cat hacking up a hairball in the bathroom. Although brief, it was pleasant. This beer gets an 8. Has it been 14 years already? Looks like it is time for another strong anniversary beer from Phillips. Don't get me wrong, I liked this beer but it just tasted the same as last year and the year before that. It tasted like the Monkey Drummer at year 12 and the Hangman's from year 13. Now that I think about it, if this beer has been aging for a full year in bourbon barrels, it very well may have been the same beer as last year. Why the number 14? Perhaps it might be in reference to 14 points of copyright infringement on the label. Despite the fact I am not a expert in copyright law, the resemblance to Donkey Kong and a Mario Bros character is easy to spot. I haven't even played these games in over two decades. That small hop guy in the bottom corner looks very similar to Goomba. And what other large ape with high eye brows carries a barrel? Am I the only one seeing the red tie with a logo on it? The nose was a mix of dry hop madness and oak character. It was an overabundance of vanilla, tannins, pine, spruce and pineapple. My mouth felt violated with each fully, sticky, slick and bitter boozy sip. Complexity is the label on my glass. There was extensive mingling of vanilla, pineapple enzymes, syrupy spruce, bourbon vapours and canned pear syrup. The flavours hung around longer than the weird neighbour after a block party BBQ. Still it was a nice sipper, but it did border on undrinkable bitter and boozy. Food Pairings: Almost too much for food. Maybe cedar planked salmon. 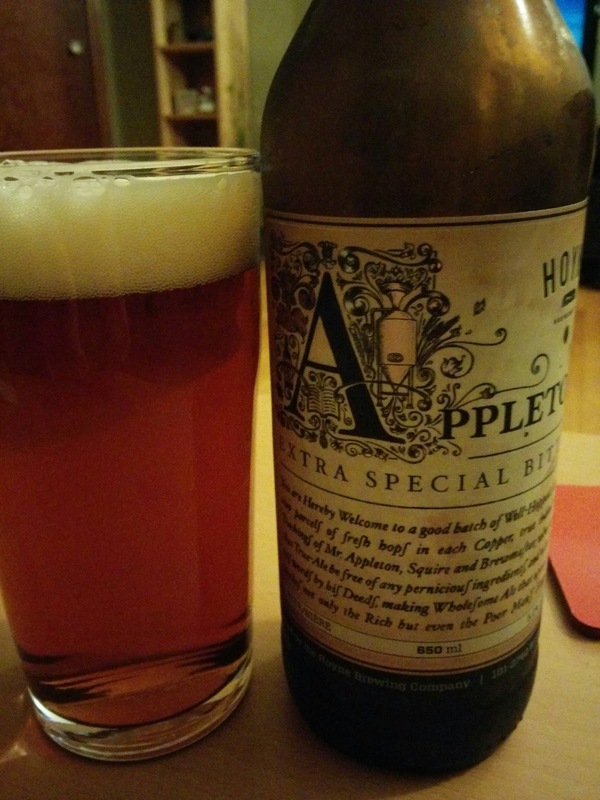 Cellar: The hop and booziness will certainly fade, but I'm not certain the malt contains suitable complexity. I'm going to say no. Just catching up on old notes so no preamble. Not familiar with the Belgo-American mild beer style, other than it is tasty. Tastes like a mix of various styles with a fancy yeast. In the nose there are grains, biscuits, a touch of citrus mixed with spicy yeast notes. A mild sticky mouthfeel yields crackers, tropical fruit hops, limes, bananas, tart wheat and again with the spicy yeast. Spicy and slick was the ending. Quite tasty. You might be able to still find this one on the shelves. Food Pairings: Lets go with a banana loaf with cloves, allspice and nutmeg for desert. I could not say "no" to reading this article,"Becoming a beer expert: Is simple exposure with feedback sufficient to learn beer categories?" This study seemed simple on the surface but had a lot of depth to it. It was especially interesting for anyone wishing to further their beer knowledge and obtain their Cicerone or BJCP Judge designations. The principle of the study seemed simple enough. A group of students were put through a 70 hour long beer sensory course. During this course, students were presented with either top-fermented beers (TF) or bottom-fermented beers (BF) and asked to determine which was which. No names or images were shown, just a bunch of randomly appearing clear plastic cups. Rather like a BJCP judging contest. Many of the same TF and BF beers were repeated during each session while new beers in each category were introduced. As expected, after repeated exposure to the same beer, subjects recognized that same beer and could correctly identify it as either at TF or BF. However, subjects did not always answer correctly for the new beers they had not been previously exposed to. Then subjects were introduced to a trap beer. This trap was a TF beer that shared many sensory traits as a BF beer. A similar BF trap beer was also given. In case you were curious, the BF trap beer was Biere du Demon and the TF trap beer was Hoegaarden. Not surprisingly, not enough subjects correctly identified the trap beers compared to just guessing. So what did this tell us about learning to be a beer pro? Not much that we didn't already know. You can identify beers that you are repeatedly exposed to, but might not be able to extend this knowledge to new beers. What was interesting and helpful was that it did explain how people learn about new experiences and remember them for latter. Many of these principles apply to learning beer styles. Much of this information was taken from learning about wine experts. Generally when we learn about something sensory we try to place it into a category (categorization). We can do this in several methods, all with their pluses and faults. In this perceptual learning model, you learn to extract repeated stimulus and detect regularities. Sounds good right? Not so much, it expects you to pull sensory information from many different encounters. What if you only drink Fat Tug? Is so, then you think every single IPA should taste like Fat Tug. This is also why people only drink one kind of beer and nothing else. Your experience has told you that beer should taste this way, any deviation from this norm is rejected as incorrect. So your drink a beer, learn those flavours and place these memories into categories. This is how you can pick out Pacific Northwest hops from European hops or Southern Hemisphere hops. With repeated training, many beer geeks can pick out specific hop varieties, malts used and yeast strains. This is done in several ways. The first is to use these sensory memories to create mental prototypes. In this method you create an ideal taste representation from presented examples in each category. This is what is done with BJCP beer training. Your learn about how an IPA, English mild or Saison by drinking the best known examples. You know what a Saison tastes like by drinking Dupont, Ommegang Hennepin and New Belgium Saison. Again this presents problems as mentioned above. If you can't find these beers, you have no idea what a proper Saison should taste like. I find this to be an issue with the Kolsch. Very few people, including brewers, may have never tasted a true Kolsch. This is a problem when you are presented with a can of local kolsch-like ale and assume this is what a true Kolsch tastes like. I refer to this as the Analogue Phenomenon. You also learn about beers from the feature-frequency theory. This is as it sounds, you build your models based on frequently occurring features of a recurring taste. IPAs frequently taste bitter, bocks are frequently sweet. This is quite handy for judging beer contests, but not much else. If a bock is excessively bitter, this is wrong. This again assumes you have lots of examples to draw from. Another method is exemplar memorization. This again is just like it sounds, you memorized what a classic example tastes like. Possible issues in this method are that memories are fading and over time you might have forgotten what Saison Dupont tasted like. Perhaps your feature frequency from local saisons has caused the exemplar model to drift. To remedy this one should regularly sample the reference beer. Big breweries do this all the time, you regularly sample to same beer over and over for changes in flavour. I like the idea of drinking Saison Dupont every six months for research purposes. However, the typical beer geek, like me, rarely drinks the same beer twice so this form of learning is challenging. So back to our beer students. What did thus study teach us about learning about beer. After questioning the students, the researchers found that there was no specific form of learning that was favoured. The results did seem to slightly favour the exemplar theory of learning as students to easily identify beers that they were repeatedly exposed to. However, the information from memorizing these flavours could not be extrapolated to new identifying new beer flavours. Researchers also felt that perhaps the sample size of beers was too small; this is perfect validation for my Untappd score. So to learn more about beer, sample lots of different beers while looking for trends and analyze great beer style examples. Oh and drink Saison Dupont often.